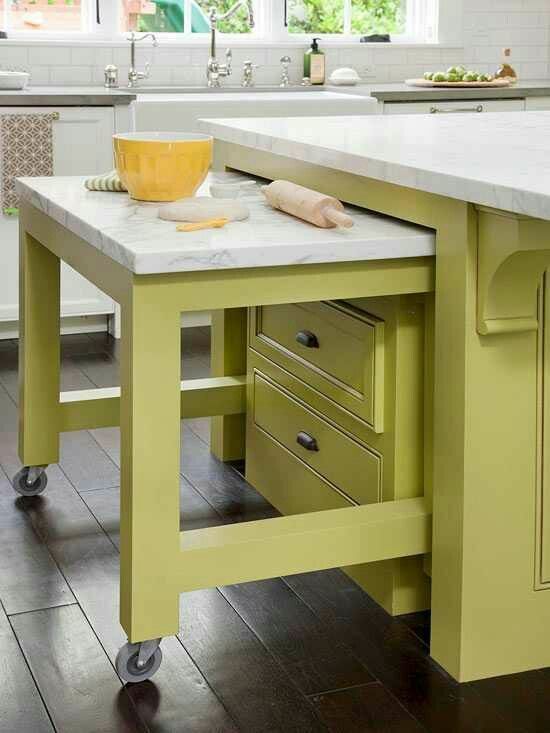 Are you interested in ideas for organizing your kitchen for gracious living? Hi Hadley Court readers, this is Jessica, Leslie Hendrix Wood’s guest contributor and, today, I’ll give you some tips and suggestions as to how your kitchen can be more organized with easy, simple steps. Even the smallest of spaces can be structured and well thought out. Because so much of our lives revolves around this particular room, it is essential that there is a place for everything, and that everything has a place. It doesn’t take much time to organize your kitchen. Placing like items with like items is a must. This way there’s no trying to figure out where something could and should be. Before you start organizing it might be smart to do a spring cleaning of sorts. Go through your drawers, cupboards, pantry and fridge. You may want to start with your refrigerator. As you do bring a garbage bag with you. Toss anything that hasn’t been used in a while. Toss items that have past their expiration dates. Nearly empty containers? Toss them. If you have started ketchup bottles, salad dressings, jars of pickles or olives that are partially started see if you can somehow condense them. You might be surprised at how many “doubles” you may have. If something hasn’t been consumed in a while, chances are it may not again – consider getting rid of esoteric salad dressings and things of that nature that sounded or looked good at the time. When you move over to your pantry and cupboards bring the garbage bag with you. This time we want you to make 2 piles. Make a pile of everything you are going to toss, and another of items you could donate to a soup kitchen or food pantry. Look at the non-perishables you may have extras of and see if they may help someone else out. 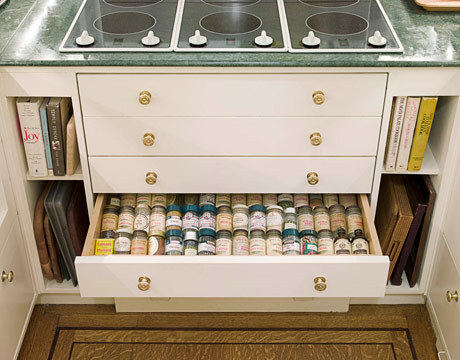 Organize your spices, I love the spice drawer below! Organize your pots and pans, Tupperware and other storage items. If you have mismatched pieces you may want to get toss the extra lid or the container that has none. Take advantage of collections. It’s possible to collect wooden spoons, canisters, spatulas and rolling pins while keeping a clean look to your kitchen space. 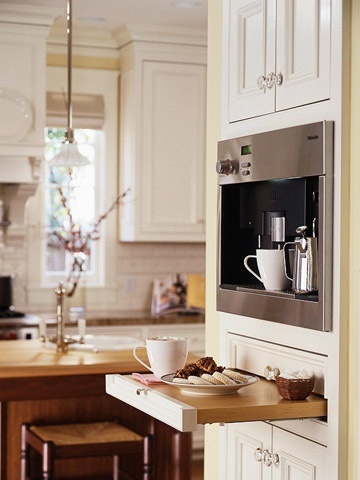 In smaller kitchens where counter space is minimal and precious, you may prefer to keep these areas clear. Walls make for great storage. 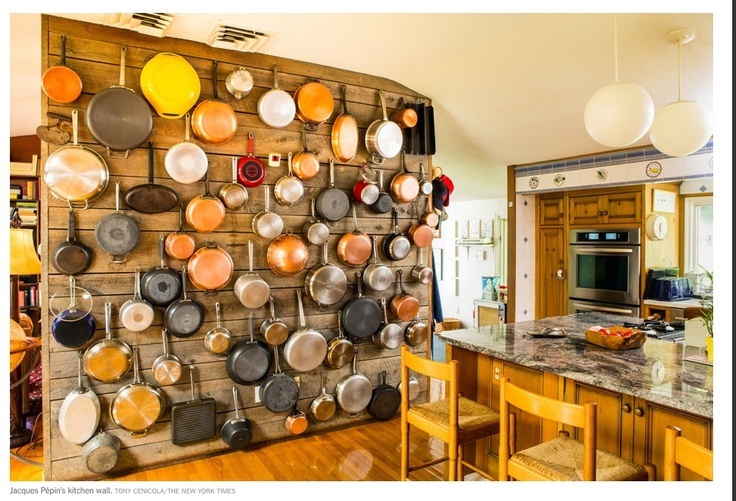 Kitchen utensils, knives, plates, pots and pans and many more items can find homes on your kitchen walls. Instant storage and instant decor – it’s a great idea. 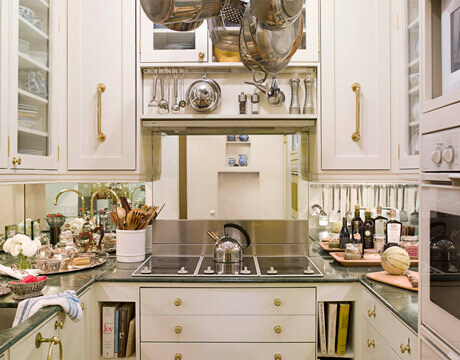 I’m madly in love with Jacques Pepin’s kitchen, below. There’s no reason why organization can’t be part of the design. Hanging pot racks work too and are equally as beautiful. By bringing your pots and pans up, you’re clearing out valuable space. Your storage can also be decorative. 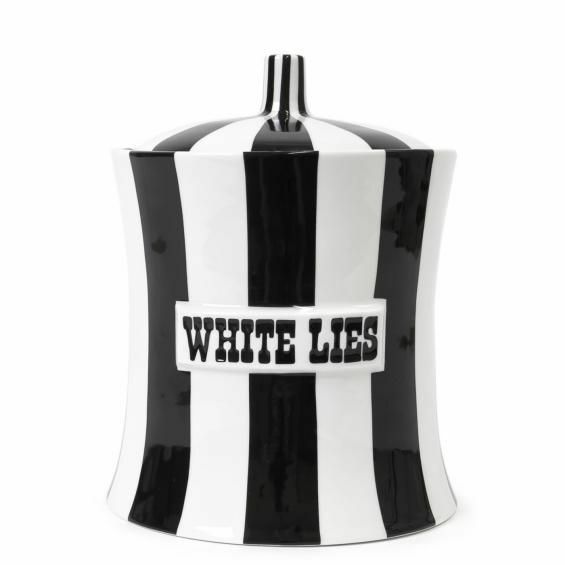 If your style is fun and whimsical you will love Jonathan Adler’s cheeky, humorous canisters. 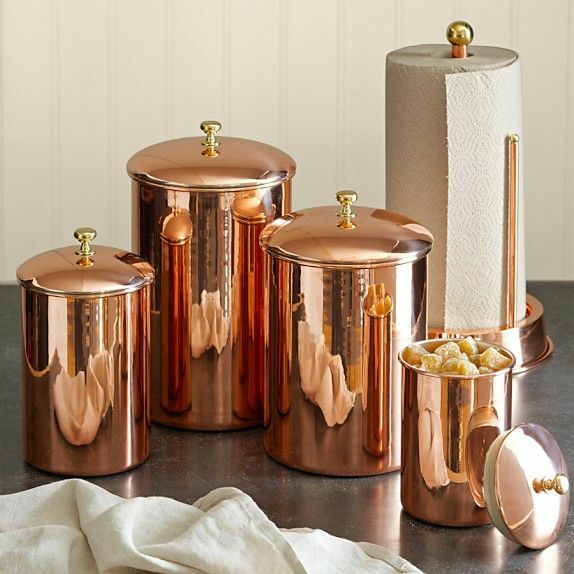 if your style is more streamlined and elegant, the copper canisters from Williams-Sonoma are nothing less than gorgeous. Again, if your kitchen is smaller you won’t want to have too much on your counters. They should be stylish, but they should also be functional. 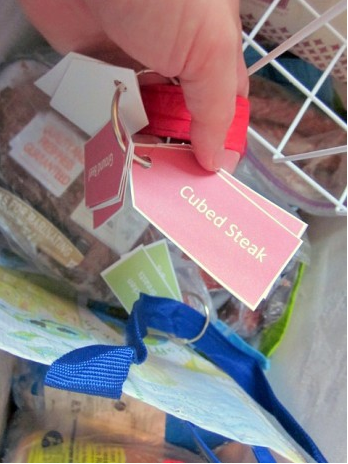 This is key in keeping an organized kitchen. Again, consider utilizing your wall space. Open shelving makes a lovely home for those items you use frequently as well as your canisters. 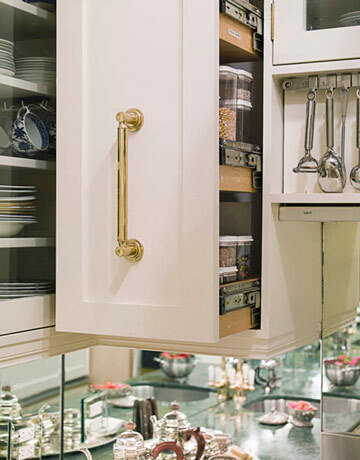 Plentiful storage and easy access will help with your gracious, organized kitchen. Consider converting your hard to access cabinets into drawers. 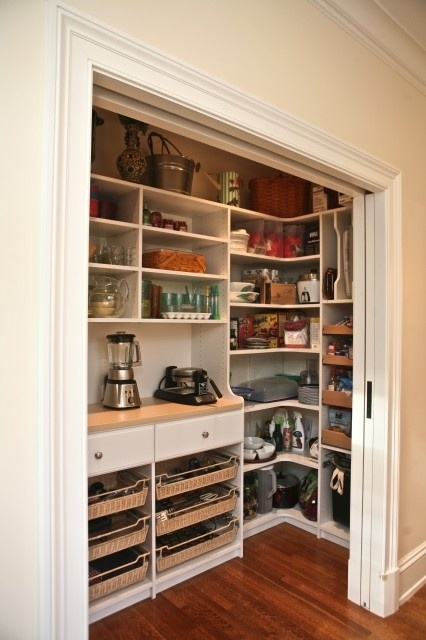 You’ll have much less wasted space and all your items will be much more accessible. Below, the hideaway table and counter space are both esthetically pleasing and functional and are ideal for the smaller kitchen. Now that we’ve discussed ideas for storage possibilities for the organized kitchen, we must also ensure that our kitchens are well stocked. It’s best to have the basics on hand. You’ll never know when you’ll need to whip something up for the family, children, friends or guests at the last minute. 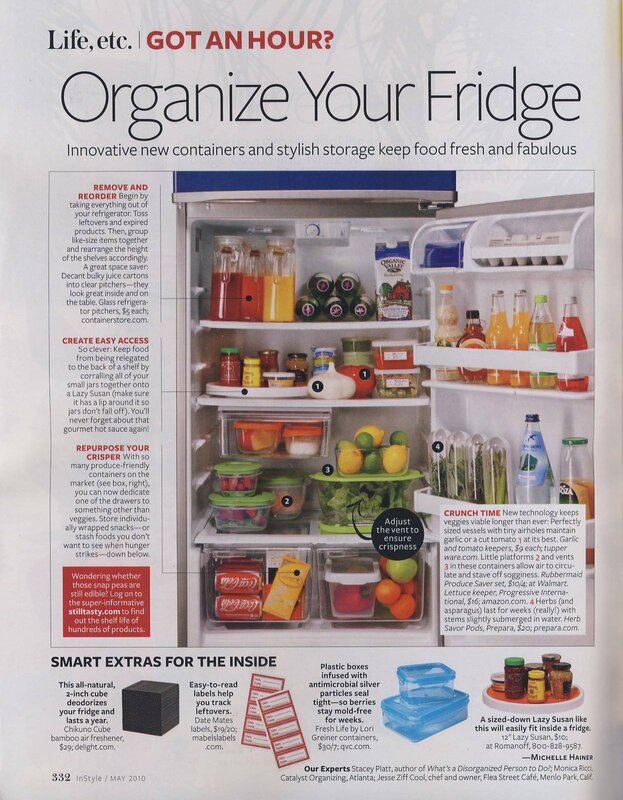 A well stocked pantry and fridge will ensure that you’re always organized and ready for any last minute change of plans. Below we offer some lists of what your well stocked kitchen might have. Note that items may vary depending on lifestyle and dietary needs. We’ve comprised these to include families with young children and teens, as well as those who enjoy entertaining on a regular basis. I’d like to have an organized pantry like this one, wouldn’t you? I like the pocket doors, which take up less space, too. Here are some more good tips. It helps to see it like this, doesn’t it? Frozen meals made in your crock pot the week before and vacuum packed – for those busy days when you’re travelling and your family needs a whole meal, fast. Click here for a link to the pretty free printables, below, so you can see what all of your freezer foods are, at a glance. 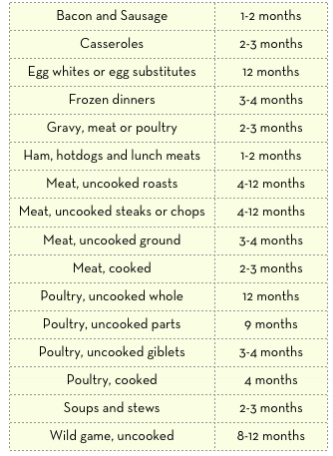 This helpful chart below by the USDA shows you how long you should keep foods in your freezer so that they retain their best quality. Remember, though, you can keep foods in the freezer, indefinitely. 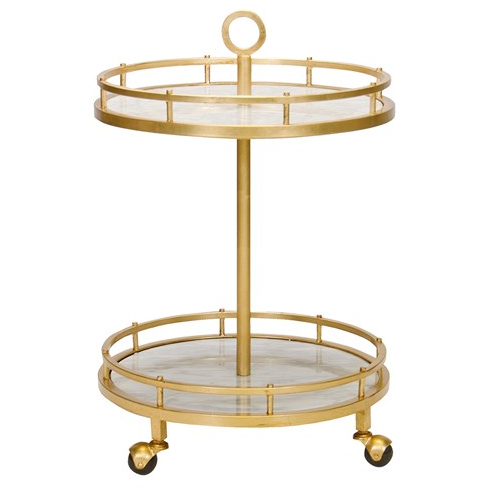 I love this beautiful small bar cart on casters, do you? It’s available from Zinc Door, here. If you need a larger bar cart, please let Leslie know, and she’d be happy to help you source that for your homes through her interior design business in Midland, Texas. I hope my tips help you live more graciously, by knowing how to have an efficient and organized kitchen. Do you have any organizational tools, ideas and tips of your own that you would like to share? Please leave them in the comments and if you’d like to, I invite you to subscribe to Leslie’s blog, here, and follow her on Pinterest, here, on Twitter, here , on Facebook, here and on G+, here. « Gracious Living: What Are The Differences Between Fine Bone China and Porcelain? I love giving pantry baskets as gifts to friends, nothing like good oils and vinegars or spices to add to one’s perfect pantry! Such a great “go to” list for a gracious pantry. What a wonderful gift idea. And yes, it is so true that nothing adds more to cooking than fine spices, oils and vinegars.